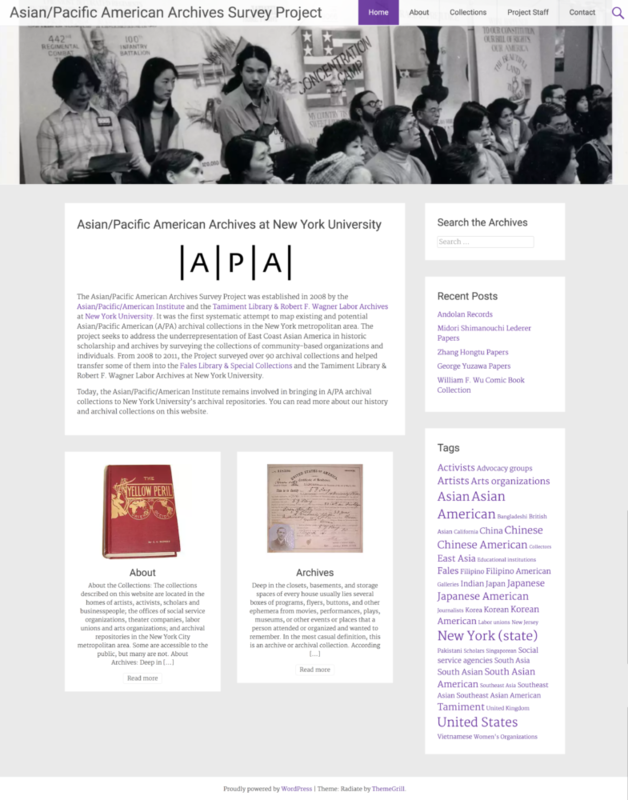 The Asian/Pacific American Documentary Heritage Archives Survey is the first systematic attempt to map existing and potential Asian/Pacific American archival collections in the New York metropolitan area. The project seeks to address the underrepresentation of East Coast Asian America in historic scholarship and archives by surveying the collections of community-based organizations and individuals. The project’s database serves as a central resource for learning about and accessing these collections, which have been surveyed by A/P/A’s Graduate Archives Scholars. If you are interested in having your personal or organizational records surveyed for this project, please email apa.archives@nyu.edu for more information. This project is a collaboration between A/P/A and Tamiment Library & Robert F. Wagner Archives at New York University. It was generously funded from 2008-2011 by the Metropolitan New York Library Council.